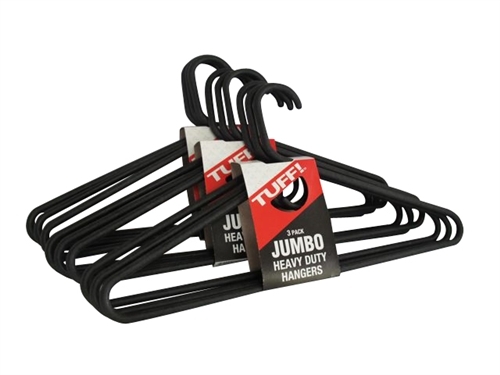 Our Jumbo Thick Black Hangers 9 Pack are made in the USA and are a dorm product that every college-bound student needs to prepare for dorm life. These hangers are really thick and sturdy; they are the perfect hangers to hang up your clothing in your dorm closet. Nine hangers come in the pack, so be sure to get a couple packs of our Jumbo Thick Black Hangers when you're ordering your dorm supplies so you can ensure that you'll be fully prepared for college move-in day! Hangers have a use beyond just shirts, pants, and coats! 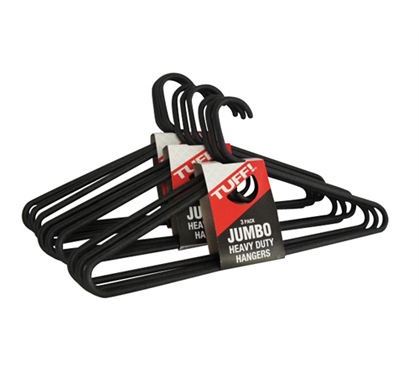 You can also use our Jumbo Thick Black Hangers for hanging up your ties, scarves, or even belts in your dorm room. While we have hangers to use for all kinds of clothing and accessories, if need be, you can rest assured that this is one dorm product that you can be innovative with to serve multiple purposes.